Tutorial: The Adafruit 20W Stereo Audio Amplifier – MAX9744 @ The Adafruit Learning System « Adafruit Industries – Makers, hackers, artists, designers and engineers! 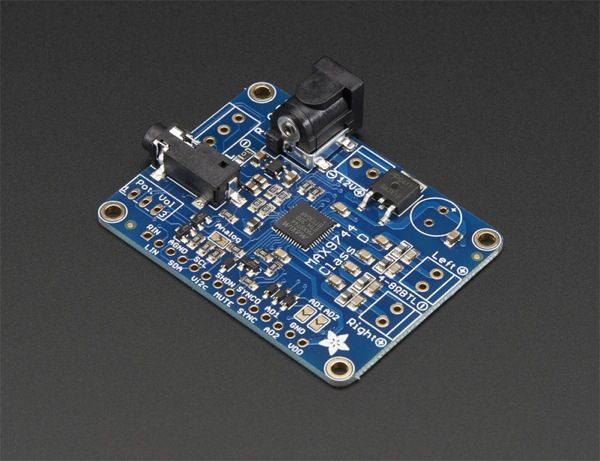 Tutorial: – The Adafruit 20W Stereo Audio Amplifier – MAX9744 @ The Adafruit Learning System. Pump up the volume with this 20W stereo amplifier! This slim little board has a class D amplifier onboard that can drive 2 channels of 4-8 ohm impedance speakers at 20W each. Power it with 5-12VDC using the onboard DC power jack and plug stereo line level into the 3.5mm stereo headphone jack and jam out with ease. Since it’s class D, its completely cool-running, no heat sinks are required and it’s extremely efficient – up to 93% efficiency makes it great for portable or battery powered rigs.